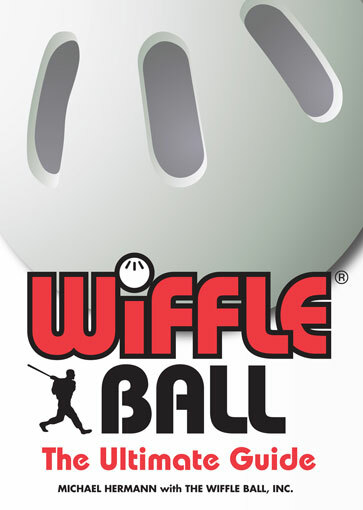 By Michael Hermann, By Wiffle Ball, Inc.
Fun and informative, this dual history and guide to all things Wiffle® gives readers an inside look at the enigma of the perforated plastic ball and the unique game that evolved around it. The book recounts the 1953 circumstances in which a down-on-his luck shoe polish salesman and his 13-year-old son concocted the first Wiffle® ball from spare perfume packaging, turning a plastic orb into an American icon. The hard science behind the ball and its seemingly unpredictable tendency toward curveballs is explained in addition to useful guides to handling the ball and enjoying the sport, such as throwing a sinker, a riser, and a screwball. The history of the variation of baseball that accompanies the plastic ball and bat is detailed along with profiles on some of the most competitive players and anecdotes from professional athletes and celebrities who have enjoyed the sport in their personal lives. This one-of-a-kind book will recall fond memories of playing Wiffle® ball and provide a thorough understanding of this quirky American recreational sport. Michael Hermann is the president of Wicked Cow Entertainment, which oversees brand management for Wiffle Ball, Inc. He is a former local TV anchor and reporter, and a former producer and host of Fox Sports' Reverse Angle. He lives in New York City.